Retirement is a double-edged sword. On the one hand, you can look forward to never having to work again and spending your days as you see fit. You are finally ready to just relax and enjoy yourself. On the other hand, you have to be extra careful about money and worry about a lot more tax obligations than you ever have before. Between your IRA, your 401(k), your pension, and your investments, you have to juggle a lot of financial information to make sure that you get the money you need without losing too much of it to taxes. With your pension, you have the option to either take a monthly payment known as an annuity or to get the whole thing as one lump-sum payment. There are many tax and financial considerations for each option, and working with an Fountain Hills tax attorney can help you make the right choice. If you choose to get a monthly annuity for your pension, you will be required to pay taxes each month just like you would payroll taxes on your monthly salary. The tax rate will depend upon your specific tax bracket, and it can take out a huge chunk of your monthly pension. Your pension is divided evenly into fixed monthly payments for the annuity option. The payments are never adjusted for inflation, which means that you will lose your buying power over time. In about 20 years, the value of your monthly payment will be about half what it is today. Take away your huge tax cut on top of that, and you will find yourself struggling to make ends meet if you have no new income sources. The lump sum offers many tax and financial advantages. If you take the lump sum, your employer will keep back 20 percent for taxes, just like it did with payroll taxes. That’s a big hit, but it is likely to be less than what you would pay with the monthly payments. You can also invest that money in a way that nets you a bigger return in the long run, actually helping you come out on top. You can lower your tax obligation even more if you roll the entire lump sum into an IRA instead of depositing it in your bank account. By rolling over the entire amount, you reduce your taxes to zero. The only taxes you will pay after you roll over your pension will be what you pay on the withdrawals, which can be less than the pension taxes. You are required to start taking distributions from your IRA at age 70-1/2. However, the minimum withdrawal is low, and the amount you pay on taxes is less than you would pay on a monthly pension annuity. The other financial benefit to taking out the lump sum is that you can leave whatever remains to your heirs when you pass on. If you were receiving the monthly annuity, those payments would stop when you die. The remainder of your pension would not go on to your heirs. Sometimes, you may request a lump sum payout from your employer but only get a check for 80 percent. Employers are only required to keep the pension funded at 80 percent, so they may not have the full amount to pay. Unfortunately, if you request a payout, you have to roll over the full value of the pension into an IRA to avoid taxes. It doesn’t matter how much you received — it only matters how much the pension is valued at. That means that you will still pay taxes on the 20 percent that was held back. The tax rate is the same as your income tax rate, and you pay an additional 10 percent penalty if you get the payout before you are 59-1/2. You could pay out nearly 50 percent of the balance just on taxes. The only way to avoid these taxes is to put your own money into the IRA to cover the difference. If your pension is worth $100,000, that means coming up with $20,000 of your own money to fund the IRA and avoid the tax penalty. That can be a significant burden, depending on how much your pension is worth. If you can’t fund the entire balance, come up with whatever amount you can. Whatever you can do to lower the difference will lower your tax obligation. Some companies offer their employees an early retirement package to convince them to leave their job rather than having to lay off employees. The package can include additional retirement subsidies to make the offer more attractive and to compensate for the extra years that these employees are out of a job. However, those who take early retirement subsidies typically cannot take the lump sum pension payout. Companies are not required to include the subsidy when calculating the payout, so employees who choose the payout are missing out on money they would have gotten. Know that if you take an early retirement subsidy, you are likely to have to take a monthly annuity, which means that you will pay more in taxes. Talk to your accountant about options for handling early retirement subsidies that can help you minimize your tax obligations. 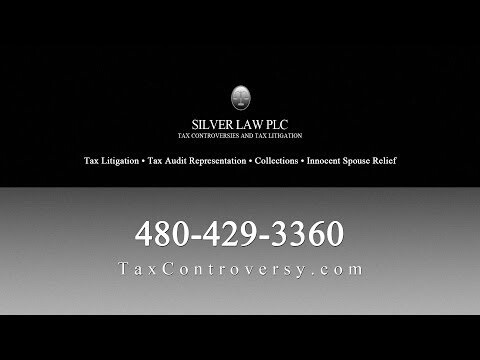 At Silver Law PLC, an experienced Fountain Hills tax lawyer can help you understand how the tax laws apply to your pension fund, IRA, or other retirement account. We help clients in Fountain Hills and nearby communities make the right choices to protect their financial futures while also meeting their tax obligations. With the right financial planning, you can ensure that you have what you need throughout your retirement, rather than losing a huge chunk of it to taxes. Contact us today to learn more about how our lawyers can help you with other tax matters, such as audits, tax litigation, and estate planning.